Answering questions on the NCLEX requires knowledge and strategy. Knowing the material is hugely important, which is why in these NCLEX study tips we’re always quick to point what calculations and areas of knowledge you should be sure to know. How you go about using that knowledge to answer questions, though, is equally important, because the National Council Licensure Examination requires strategy to put your nursing knowledge to good use. In our last two sets of NCLEX study tips we discussed strategies for multiple choice questions and alternate format questions. 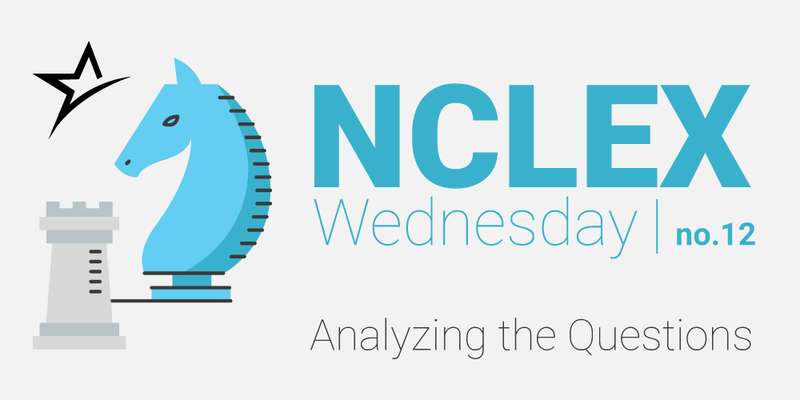 Today, we’re taking a broader look and presenting eight steps of analysis you should use for every NCLEX question. We’ve said this before, and we’ll say it again: First read the entire question before looking at the answers. A huge portion of incorrect responses aren’t due to lack of knowledge: They’re from misunderstanding the question by failing to read it all the way through. Take your time and don’t rush! What you initially think the question is asking may not be what the question is really asking. Test yourself while you’re taking the test. Before moving on to the answer options, try to reword or rephrase the question. Being able to restate the question in your own terms will ensure you know you understand what the question is really asking. Remember, different NCLEX questions are asking different things. One of the quickest ways to ensure you know what a question is asking is to determine if it’s priority, positive, or negative. Priority questions are those that often have more than one correct answer and you must determine which action you will perform first. Positive questions have only one correct answer, while negative questions have one incorrect statement—and that would be the one you’re looking for. Once you’re sure you know what the question is asking, look at the answer choices and carefully read and consider each option. Scrutinizing every one of them—in light of the question—before going on to the next will keep you from answering hastily (and incorrectly). As you’re reading through the answers, decide whether they’re right, wrong, or possibly right. If one of them is obviously not correct, eliminate it immediately, and do not return to consider it. If it is a possible answer, then keep it in mind as you read the other options. Remember, with negative questions, the “right” answer will be the false one—which is why it’s so important to ensure you know the type of question first. After scrutinizing the answer options, you’ll probably be left with a few that either seem right or at least possibly right. If one answer seems better than another, then put that answer at the top of your choices. Try to narrow the options down to two, and then go back and reread the question with those two in mind. Look for clues in the question to determine which option is the better of the two. Finally: Make your selection and move on! Don’t stay on the question to allow time to second-guess yourself. The NCLEX is timed, so you can’t deliberate over a question forever, which is actually good, because second-guessing tends to be more detrimental than helpful. More often than not, if you panic and change your answer, you will move from a correct answer to an incorrect one. P.S. We love feedback. Post to our Facebook page or give us a shout on Twitter with comments or requests for specific information you’d like to see in the series. Happy studying, and see you with more NCLEX study tips next week! For more NCLEX study strategies and advice, you can download our full NCLEX ebook here, for free! About NCLEX Wednesday: AmeriTech’s NCLEX review course has helped our nursing students pass the NCLEX with flying colors. We’re spreading the love to all nursing students as part of a weekly series. Nurses unite! Ameritech Blog direct to your inbox. What’s the Difference Between Occupational Therapy and Physical Therapy? Nursing Specialties: What Kind of Nurse Gets Paid the Most? You have already requested information using this form. Please call us at (801) 816-1444 so we can answer all of your questions. © Ameritech Inc. All Rights Reserved.